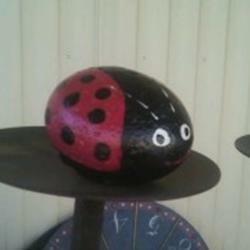 $6.00 Categorized under: decorated river rock, ladybug. This is a lovely ladybug from a river rock that is about the size of the palm of your hand. It makes a nice paper weight or accent decoration amongst your potted plants.